The New Mexico landscape captured me on my first drive through the state on my way to LA in 1985. Now, moving to live here, I face the daunting challenge of making a thoughtful and relevant photograph of this place that is unique (a lot of very good landscape photographers have made outstanding images here before me), personal, representative, accurate and imbued with the aesthetic and spirit that makes me appreciate it like no other place. I stumbled across my view in Lamy. As you head southeast out of Santa Fe the land-to-dwelling ratio inverts, and soon the houses are hidden behind gentle hills dotted with the unmistakeable scrub vegetation that I can’t yet name. Dust-devils spin ghostly columns that float across the road and then vanish, and color mutes in the desert sun to a pale palette of dirt and sage and a blue-white sky. Arriving at the Lamy train station I imagine that to passengers a century ago this must have seemed like the middle of nowhere (it pretty much does today) – and that would have been the reason for coming here. 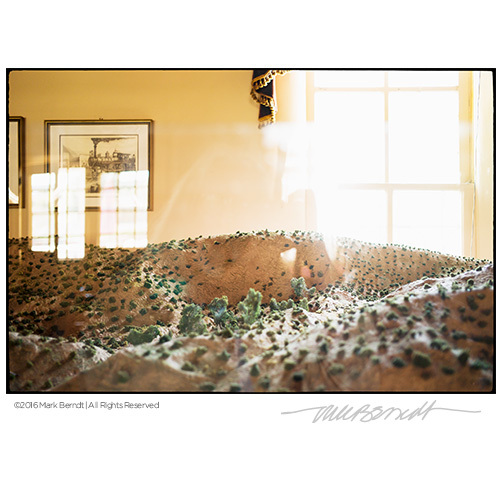 I shot my landscape, however, across the street, County Road 33, in the Lamy Railroad and History Museum, inside a glass case where an exquisite HO-gauge model of the station and a working miniature of the Southwest Chief clicks in a circuit through the hills and back to town. I’ve seen model train layouts before, but none so successfully captured the look and the spirit of a place as this. The glass let me layer a suggestion of myself in the image, not yet fully formed here in my new home. My New Mexico landscape. I’m not sure I can top this.